Emotional Freedom Techniques (EFT) is a form of psychological acupressure that uses a gentle tapping technique instead of needles to stimulate traditional Chinese acupuncture points. Throughout our lifetimes, each of us has learned important lessons about how the world works, and our place in it. We learn most of these lessons by watching, observing, experimenting, getting hurt, and both consciously and unconsciously evaluating our own and others’ experiences. We find ways to not get hurt, to avoid things that feel bad to us, and much, much more. While we learn, we experience emotions– reactions to the things we experience that can vary from person to person. These emotions effect can affect us on a profound level. EFT provides us with a tool that essentially makes us feel better. At its simplest, EFT helps us accomplish two things. The first is that in moments of high stress and high emotion, stimulating the acupressure points helps us calm down. It allows the blood to come back into the frontal cortex, which is where it gets drained from when our bodies experience stress– the fight, flight, or freeze response, and it lowers cortisol levels, bringing that reactive process back down to a normal level. Second, EFT helps us address the underlying reasons to what caused us to react the way we did in the first place, going back to those lessons we learned about ourselves and the world when we were still figuring out how things worked. This process is a little more complicated than just using EFT in those emergency, stress situations, which is why training is helpful, and necessary if you wish to use this tool to work with other people, or integrate it into your existing practice. “Energy psychology is a clinical and self-help modality that combines verbal and physical procedures for effecting therapeutic change. While utilizing established clinical methods such as exposure and cognitive restructuring, the approach also incorporates concepts and techniques from non-Western healing systems. Its most frequently utilized protocols combine the stimulation of acupuncture points (by tapping on, holding, or massaging them) with the mental activation of a targeted psychological issue. 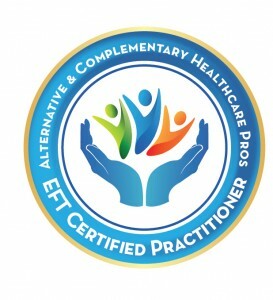 The EFT Certified Practitioner Course is a unique, all-inclusive opportunity to become a fully certified EFT Certified Practitioner (EFT-CP) in as little as four months– complete with participating in training over the internet, certification tests, 28 hours of advanced EFT training videos, extensive mentoring and practice, as well as all of your certification materials, and more! 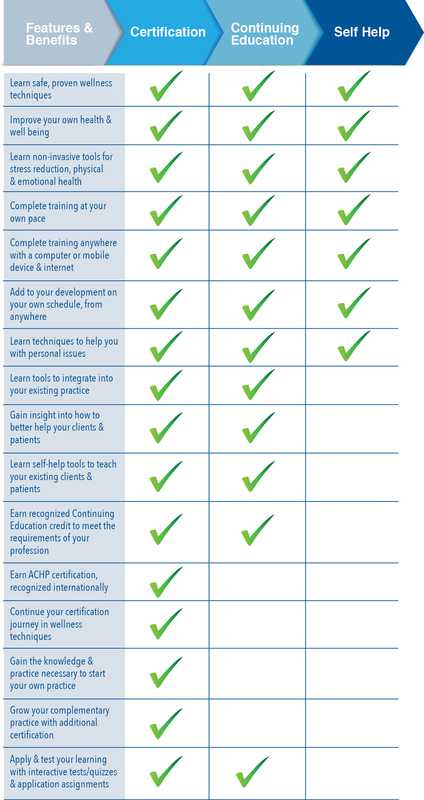 (CE 70 hours Approved Provider Number: 452036-12) If you have previous EFT training and practice, please contact teacher@wellnessonlinetraining.com to see available discounts. Our EFT for Self Help course is ideal for those interested in utilizing the potential of EFT to use for their own personal health and well being.